Too expensive. A waste of money. I don't need insurance. I don't know how much I'm covered. My parents bought insurance for me and handles it. These are just some of what people say. I've had some friends who said that when the topic is broached. Insurance isn't easy to understand at all! So many policies, so many insurers. To be honest, I'll still choose to let my parents handle it all. But I'm no longer a little boy. I took it upon myself to understand all my policies that my parents bought and which are the policies that I bought on my own. As to how it really started, other than me turning 21, it was also partly due to me wanting to know what I am actually buying. So it is time to look into the policies I have. Readers who know more about insurance, feel free to correct me on any point. Gladly appreciate it! Covers every CPF member from 21 years old and insures $46,000 in event of death or Total Permanent Disability up till 60 years old. Review: This is a no-brainer. I'm keeping this. 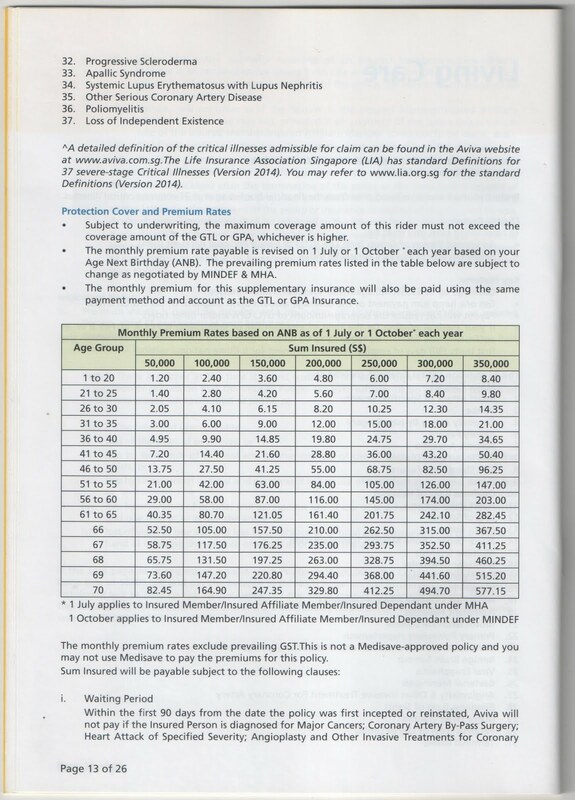 Yearly premium is $36.00 now(note: premiums change with age) and paid through Ordinary Account in CPF. This is what every male who went through NS will probably have. 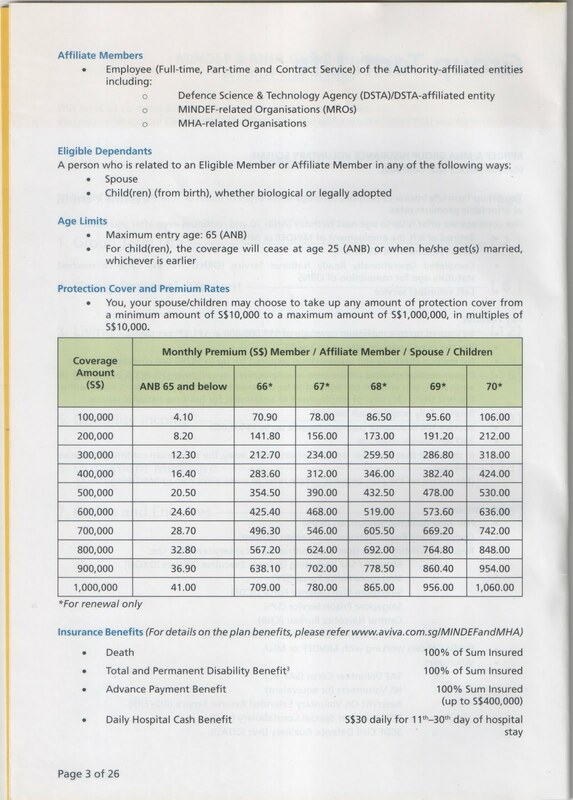 I'm currently only insured $100,000 for Term Life and Personal Accident, paying $12.80 a month. After 1st October though, with the same $100k coverage, I only pay $5.17 a month. Half price. 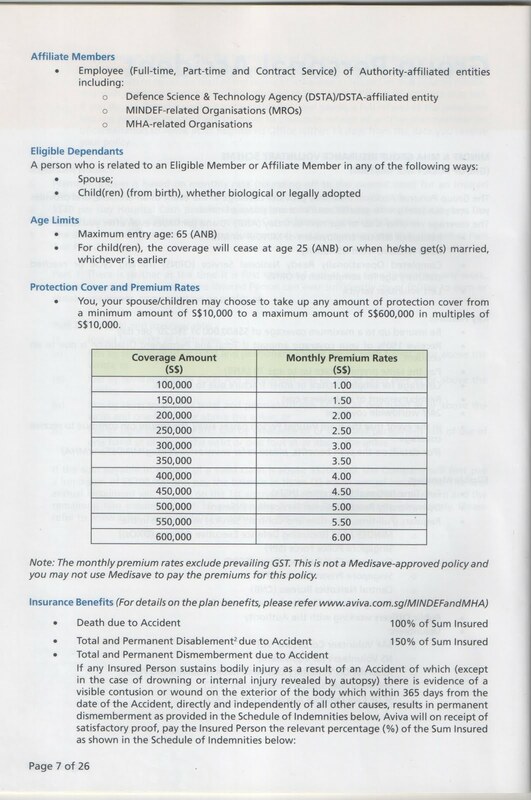 Review: Is $100k coverage for Death enough? No, if I die. My parents raised me up and I should at least make sure their retirement is comfortable if I am to pass away. If I do not die, but become permanently disabled or lose a limb due to an accident, then the Personal Accident(PA) will come in. So I'm planning to increase to $300k for Death/TPD and $500k for PA for now. 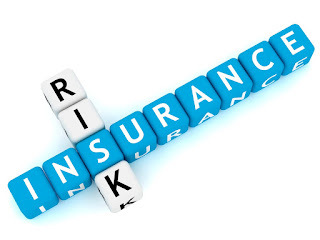 There is group risk and hence, some limitations to policy cover. I will try to look for alternative insurers to diversify. My parents bought this 4 plans when I was 1-2 and 6 years old. 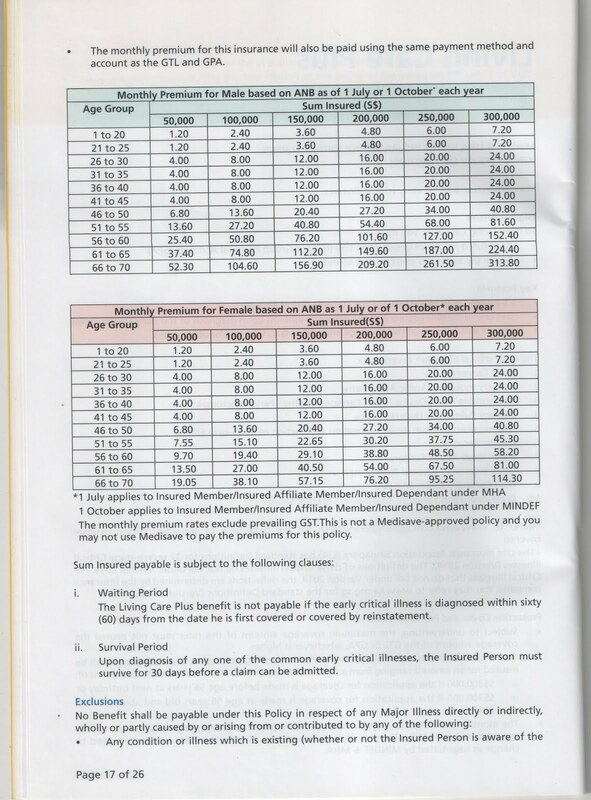 The sum insured is only $42,000 in total and premiums are close to $500 a year. This comes with cash values and there are surrender values. Covers Death and TPD. 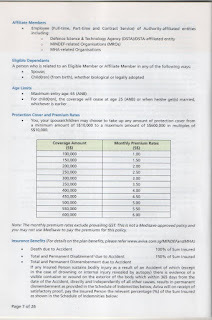 Review: $500 a year isn't cheap for $42,000 coverage. It is a 100-year policy, though $42,000 will be grossly insufficient many decades down the road. I should see the returns in the cash value then. I don't mind such plans if I'm comfortable with the returns. 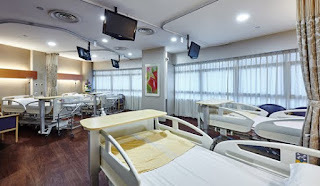 Am trying to assess AIA eCare for latest data. 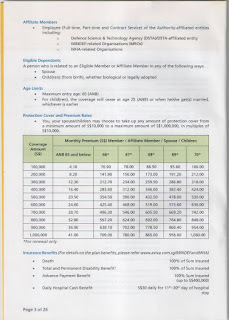 I have a Great Eastern Supreme Health Plus B (Integrated Shield Plan) and premiums are $259 for age 21-30 now with no rider. Review: No-brainer, a must-have. According to the policy, I'm entitled to class B1 wards in government hospitals. I think I will be comfortable with B1 ward. As to whether I will want to add the rider(need to pay in cash), I think it is a good idea. As a young adult, the rider will help to pay the deductible and co-insurance and allow you to build your own Medisave and cash savings first. I have not joined the workforce, so this Disability Income does not really apply yet to me, but I will be keeping it on my radar. AVIVA seems to offer immense value in the Group Insurance Living Care and Living Care Plus Critical Illness(CI) policies. Review: The way I view it, CI plans are a must. Even if the ISP with rider should cover most medical expenses, the time required to get back to work can be a few months to a year long. In the meantime, Early CI(lower chances of dying) should compensate for the income loss. I'm aiming for $100k coverage for CI and early CI for now. It will be difficult to talk about insurance because honestly, it is pretty boring. Who gets friends talking about it? But among some friends, I find that they are not understanding insurance enough. Some prefer to only know when they go out working or leave it all to their agents, without sufficiently understanding their own circumstances. For me, I will want to know what are the specifications of the product first, just like before buying a gadget. Still lots of hard work ahead. My gratitude to the financial bloggers who wrote a lot on insurance. It has been of much help. Tends to be we ignore this until we start experiencing the penalties of it! It's great you're seeing the need to think about it early. Best to get it squared off before we start developing illnesses that become pre-existing conditions that will get excluded or loaded. 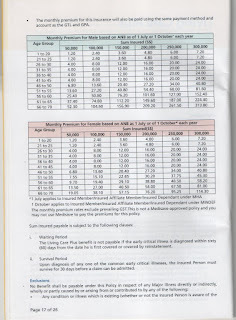 One worries the impact of these in time to come should the exclusions become the cause of medical costs! Unfortunately, I do have an exclusion for any future insurance. That probably attributed to me wanting to know more about insurance as well. If only I knew about insurance way earlier and now to not let others be in my shoes. Theoretically you wouldn't need any life insurance because you have no income yet and hence no dependants. 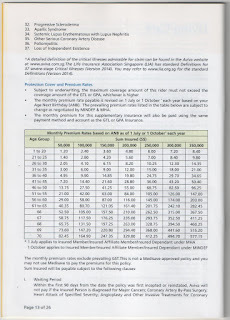 However, the premium is low and I over insure just to ensure that my parents can retire comfortably. Yeah! At the very least, it's the only thing we can give if we pass away before them. If you have dependents, then life insurance is a must. You don't have to leave them millions, but when you leave enough to cover burial expenses and future costs of living, a hundred thousand can be more than enough. A policy that low would run you less than a dollar a day, so save your coffee money and get that policy.